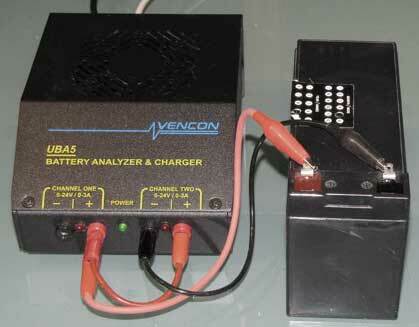 The UBA5’s capability can be extended in both current, power and voltage to handle larger batteries. We sell UBA5s with their voltage range extended to handle higher voltage batteries. See our UBA5-44V to UBA5-70V. The easiest method to increase the current and power handling capability of the UBA5 is to parallel its two channels. This doubles the UBA5s capability. In the photo below a channel combiner adapter is used to parallel both UBA5 channels allowing a discharge rate of 6A. This test is more demanding of the battery and will give more accurate results. 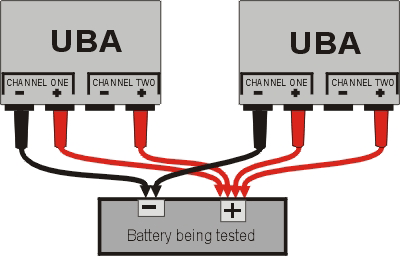 For even more current and power you can combine the channels of more then one UBA5. In the photo below we connected four UBA5s together in order to to give us a discharge ability of 24A with a 360W limit and 16A of charge current. We used that capability to test a 2.3Ah 19.4V battery at 8C. We could have gone to 10C discharge by adding a bit of series resistance (longer wire). Of course purchasing multiple UBA5s isn’t very cost effective (see our HCLM for more cost effective solution), but it’s nice to know that if you already have the UBA5s, you can combine them for higher currents and power.